Robotic Fabrications Visiting School is a series of architectural experiments based at the Architectural Association's Hooke Park campus. Operating as an experimental research branch of the AA’s Design + Make programme, Robotic Fabrications reinvents and hijacks traditional making techniques and tools – applying them to innovative processes for architecture. This year’s programme, Circular Saw Tactics, will operate on small timber sections with precision and high speed, producing exquisite components. 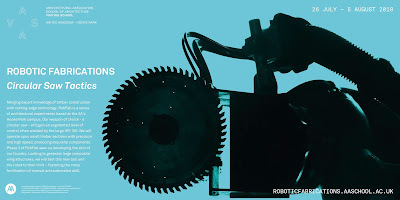 The weapon of choice – a circular saw – will gain an augmented level of control when wielded by the large KR-150, allowing users to perform operations with surgical precision. In Phase 3 of the visiting school, participants develop the skin of the foundry. To generate large composite wing structures, participants will test this new tool and the robot to their limit – fostering the cross-fertilization of manual and automated skill. The pace of Robotic Fabrications is furious. By merging timber construction with cutting-edge robotic fabrication and 3D scanning technologies, the programme offers a hands-on introduction to the world of robotics through the format of a 10-day visiting school. Robotic Fabrications is open to current architecture and design students, young professionals and anyone interested in the relationship between fabrication and technology.